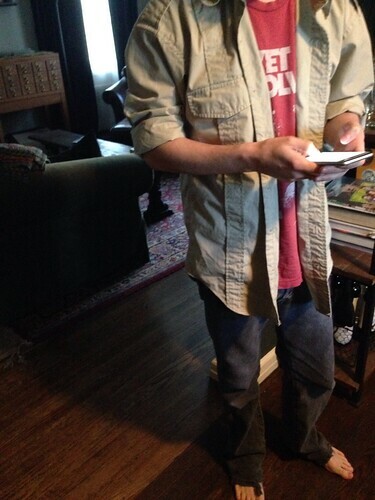 Middle bought himself an Indiana Jones shirt. Now, make no mistake, I don't mean that Middle purchased a safari shirt, or a cargo shirt or a khaki shirt. I mean that Middle, being Middle, researched for quite a while and bought the exact same shirt that Harrison Ford wore in, I think, the first Indiana Jones movie. The problem is that Middle is very slight. He bought a "small" but it was still pretty big on him. As it is 100% cotton and Middle aspires to the "worn" look, he immediately washed and dried it. I wasn't home for the process but it looks like it was somewhat effective. It's still a bit large in the shoulders and a tailor told him there was nothing she could do. But Middle and I had another thought. We realized that it was really just too long. I mean, the body of the shirt is a little large for him but it's not an uncomplicated garment so there wasn't much I could do about that save for putting darts in the back and we agreed that that wouldn't work. Minus a few inches, though, and it would be pretty damn good. We laid it flat. We made a pattern of the bottom from newspaper and then I cut it up. I decided to do a test-run on the discarded shirt fabric as I haven't used my sewing machine in a long time and wasn't sure how it was running. As near as I could tell, the bobbin thread was very loose. If you've done any sewing you know what that looks like. With a snip and a tug I was able to remove long lengths of sewing with little effort. But how to tighten the tension in a bobbin? Middle and I sat with YouTube and figured it out. It took a while but we were successful. And THAT'S how we realized it wasn't the bobbin thread that was the problem. Ten minutes later I discovered where I had mis-threaded the machine and three minutes after that the shirt was complete. Thus ends my sewing adventures...probably for another year. Now that that's accomplished I have to roast a chicken. I'm coming over with 4 pairs of pants that have sat on my dresser for..oh..let's just say last season. Well done! As an experienced sewer -- sewist? -- I have to tell you: that is NOT an uncommon error. Also, I have always had one of those hemming feet, whatever they are called, and I have never ever used it. I prefer to fold the hem and press it, then sew it. Less chance for mechanical failure that way. Well done, you! I don't even own a sewing machine. We stitch by hand here, fearfully and with great trepidation. I'd never attempt that kind of alteration.